Andy Grammer will be kicking off his “The Good Parts” Tour at The Ritz Ybor on September 28, 2018! Along with Grammer, you’ll get to experience two killer openers, John Splithoff and Josie Dunne. 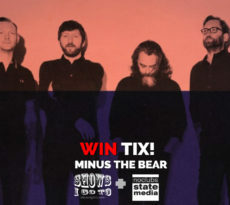 Make sure you follow the instructions to get the chance to win free tickets to this show (thanks to No Clubs)! 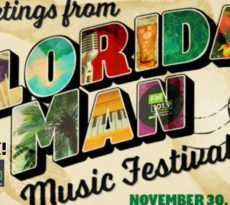 GET YOUR TICKETS TO ANDY GRAMMER W/ JOHN SPLITHOFF IN TAMPA, FL! 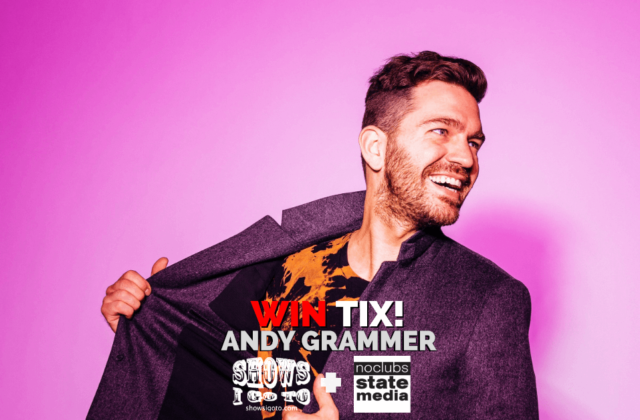 RSVP TO ANDY GRAMMER W/ JOHN SPLITHOFF IN TAMPA, FL! He’s a multi-platinum selling pop artist who is all about empowering the world through his music. He became the first male pop star in 10 years since John Mayer to reach the Top 10 at Adult Pop Radio on his first two singles! It’s not surprising with singles like “Keep Your Head Up” and “Fine By Me” that Grammer’s career has reached such success. Coming from his sophomore album, Magazines or Novels, the single “Honey, I’m Good” became one of the best-selling songs of 2015 in addition to hitting triple platinum. Talk about an infectious song! Andy Grammer is touring behind his third studio album The Good Parts. This album embodies his inspiring idea to communicate his truths through music. He puts a spin on his typical pop sound by integrating hints of EDM, hip-hop, and reggae. The lead single from the album, “Fresh Eyes,” has hit a whopping 293,000,000+ streams on Spotify — surpassing that of his previous jam, “Honey, I’m Good.” This album leaves us with that familiar sound that we know and love but with a unique twist. You can hear his tenacity and passion throughout the album which he is sure to bring to the stage on tour. 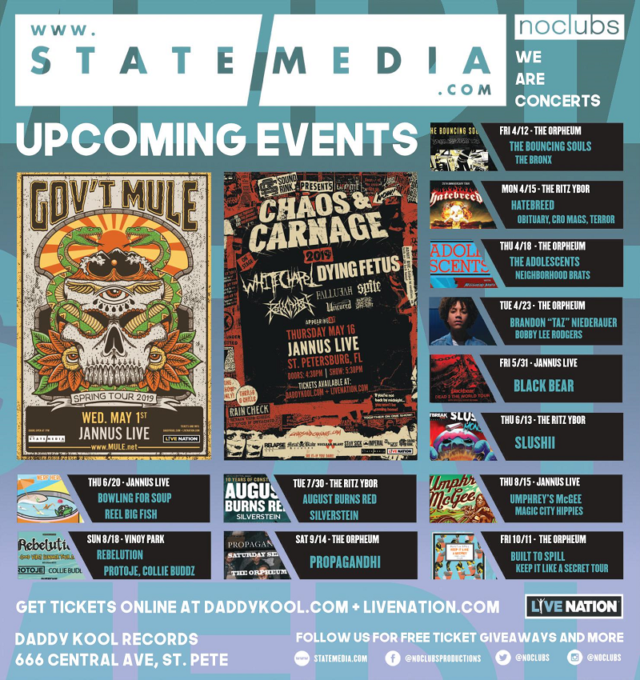 Arrive early so you don’t miss out on the supporting acts, John Splithoff and Josie Dunne! Josie Dunne offers us a Motown-era influenced sound with a modern feel. She brings forth an authentic and nerdy vibe into her music while utilizing a lot of visual components onstage in hopes to take you somewhere special. John Splithoff has a suave element to his music. He encompasses a lot of throwback soul tones mixed with modern, laid back pop vibes. 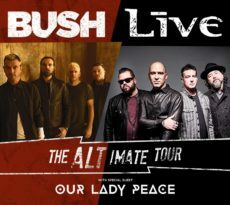 What better way to accompany Grammer than these unique artists?! 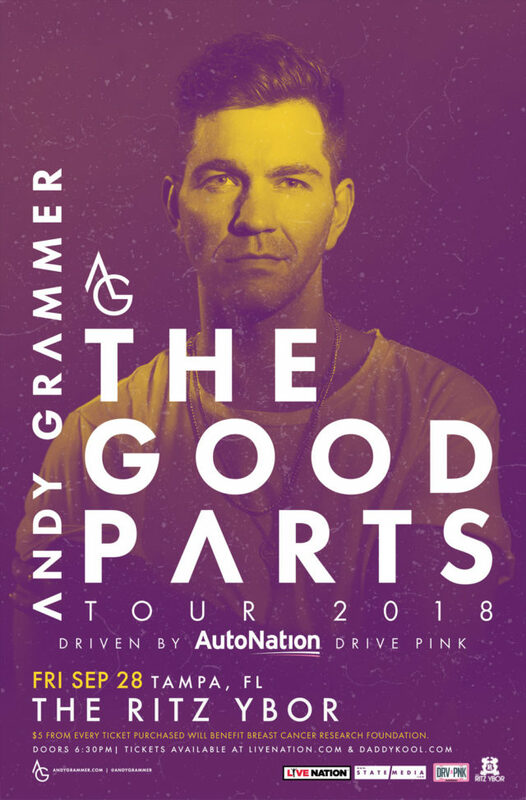 The Good Parts Tour is in partnership with AutoNation, where 5 dollars from every ticket sold is donated directly to the Breast Cancer Research Foundation! His song “Give Love” is featured in AutoNation’s Drive Pink campaign so the partnership was a perfect fit! CONTEST ENDS: WEDNESDAY, SEPTEMBER 26, 2018 at 4:20 P.M.
TAMPA — WIN TIX to @andygrammer + @JohnSplithoff at The Ritz Ybor, Friday, Sept. 28th! Winners announced Sept 26 @ 4:20pm! GET YOUR TICKETS TO ANDY GRAMMAR W/ JOHN SPLITHOFF IN TAMPA, FL!